Outfitting or upgrading a press line with capable control technology, as is the case here, is only step one. Step two: using it. Disabling tonnage monitoring or die-protection functions, for example, will keep production moving, but only until catastrophe occurs, and along the way part quality and press reliability surely will decrease. 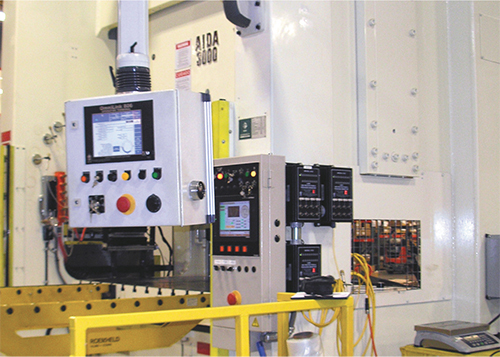 Press controls have advanced to the point where they can communicate with all line components, and even have the ability to alter press tooling on the fly. Controls have adapted to the increased use of cellular manufacturing, and the need to communicate more closely with the entire cell. They provide real-time information on job status, and integrate with MRP and ERP systems, enabling improved tracking and ordering of materials, for example, and aiding company decision makers with scheduling as well as tool and equipment performance and maintenance needs. Diagnostic tools in the controls show input and output status using architecture that enables rapid troubleshooting. These tools enable safe I/O examination without the need to enter hot electrical panels. Controls today provide an abundance of historical data used to create baselines and chart performance for a variety of uses. Combined with robust sensoring, they assist in error-proofing, allowing metalformers not only to verify good parts, but also to receive verification reports generated by automated systems. No longer do controls offer only stroke counters, but good-parts counters as well, while making sure, via control of chutes, conveyors and part-ejection mechanisms, that good and bad parts route accordingly. They’ll assess coil entering the press and, via servo and stepper motors, automatically adjust wedges in the die to account for variations in material thicknesses. In short, controls can set, run, correct and report across an entire manufacturing cell or press line. Everything above has been documented in the pages of MetalForming. We know that controls have tremendous capabilities, and provide powerful tools for operators and on up to the C-suite. But outfitting or upgrading a cell or line with capable control technology is only step one. Step two: using it. Phillips has seen some of the largest manufacturers, including OEMs with millions of dollars tied into their press lines, shut down these systems. After recalls, he notes, some of these manufacturers blamed the recalls on not following their own quality procedures, i.e., shutting down monitoring functions. As business cycles fluctuate, so, too, does attention paid to monitoring and data gathering by manufacturers. Part of the problem, in Phillips’ view, stems from the ongoing skills challenge as metalformers and fabricators seek to fill positions with qualified applicants and retain skilled workers. “Whether through a lack of skills or a lack of training once they are hired, sometimes employees are not properly prepared for the things they need to do,” he says. Where controls providers and other suppliers to the industry can help is by making equipment operation and monitoring as intuitive as possible. No need for a time-consuming once-over by the maintenance department. Besides providing assistance on the shop floor with improved messaging and prompting capabilities, controls act on monitoring functions by keeping management informed, another reason why manufacturers should not disable monitoring, according to Phillips. Thanks for the reminder even though I believe we push for safety and NO short cuts to save our workers and machines any harm.